A special post for the taller of my sisters in law, who is dating the last thatcher in Britain. While there may be debate over who whittled the guards. 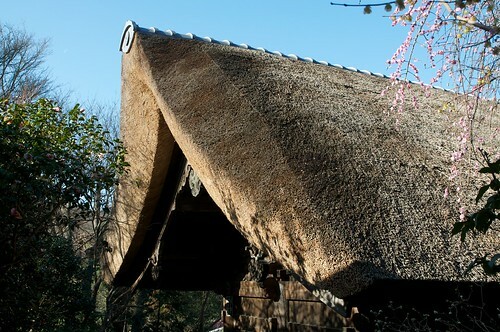 where and when, the thatched roof of the guards' house at Sugimotodera dates from 2009/2010. It was being redone and all under scafolding when we visited in June 2009. Looks like a beautiful job to my inexpert eye. Up the hill past the guards' house, the roof of the main building, which houses no end of important cultural thingumajigs, seems to be enduring more interesting times. 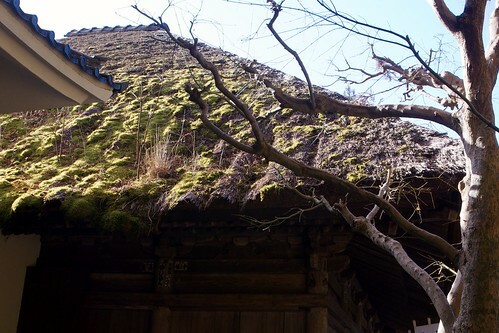 The part of the roof shown in the top picture is beautiful. My wife tells me that in Venezuela there are still lots of Indians (native Americans) who live in the jungle but work on fancy thatched roofs in civilized areas (like on a fancy theme restaurant). She says they drink beer all day long while they are working (evidently that is the major part of their compensation) even though the work is dangerous because they are up pretty high and there are holes in the roof. They sleep on mats they construct out of the roofing material right at the job site.